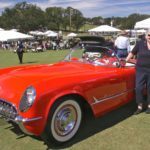 SOUTHERN CHARMS: 2017 ATLANTA CONCOURS! Posted in Concours, SOUTHERN CHARMS: 2017 ATLANTA CONCOURS! Tagged '55 Corvette, Arnott-Climax, Aston Martin DB5, Chateau Elan, daimler SP250, Howard Walker, Lozier 14, Mercedes 540K, Mogan Super Sports Trike, Packard 745 Phaeton, Porsche 356 America Roadster, SOUTHERN CHARMS: 2017 ATLANTA CONCOURS!